This is a sweet simple story about what makes a family. 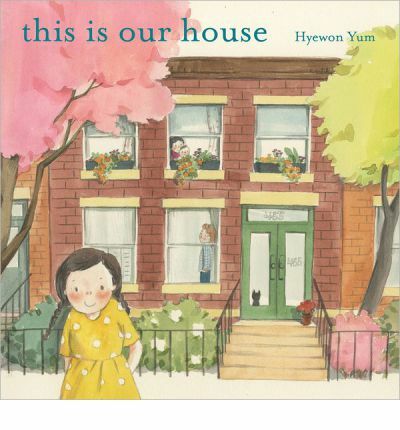 It makes use of illustrated pictures of the same house on the same urban street to show the passage of seasons and generations, from the cold wintery day a child's grandparents arrived in from Asia to the blooming summer day on which her baby brother is born. Fine details in the same area, from changing pictures on the wall, to flowers on the bushes and food on the table, help a young reader understand the flow of time through one house. The beautiful soft colours and rosy-cheeked family members make reading through this a number of times a pleasure and not a chore. This is a superb easy reader with a number of sight words and grade 1 vocabulary words. It was easy for my 6-year old to read through it, as there were also repeating words but with enough differences to add interest when learning new vocabulary (like "autumn"). The most unique aspects of this story are those that happen only in the illustrations. Co-sleeping, co-habiting multi-generation families, and inter-racial families are still rare in North America, and even rarer in storybooks. My kids were thrilled to have a picture book where the kids look like them, so I think this will be as big of a hit in our house as Spork has been. Part of the Grade 1 curriculum is to look at family trees and how families are made, as well as introduce vocabulary for different relationships. This was a great book for us to spark discussion about what is different between this family and ours. I think it would make a great addition to the Grade 1 libraries at school and home.